The Harbour House is a country style home overlooking Murray Harbour on beautiful Prince Edward Island, Canada. 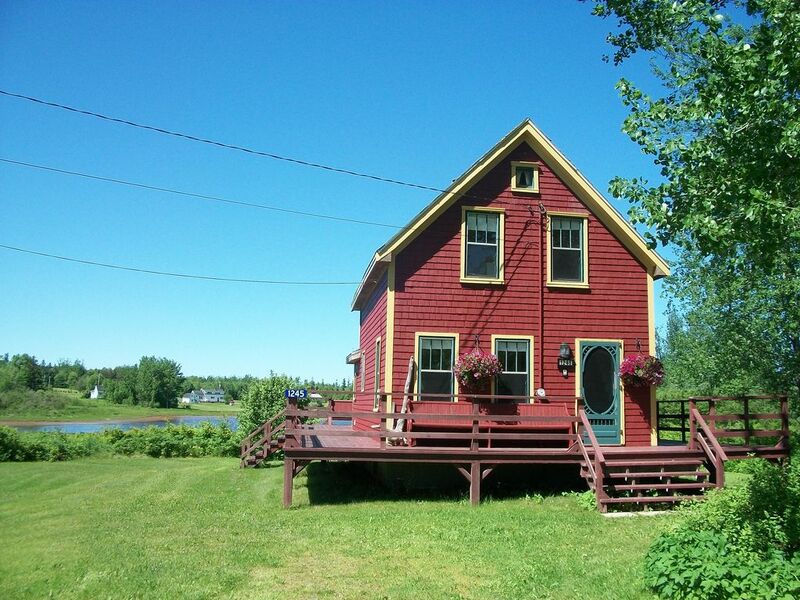 It is available to rent on a weekly basis and is just a 15 minute drive from the Wood Islands Ferry - the Gateway to PEI from Nova Scotia. The main level has a cozy living room and a large country kitchen. The 600 sq.ft. deck is where you can drink your morning coffee overlooking the ocean while watching the Canada geese and blue heron or BBQ the evening meal, while enjoying the sunset. The house comes fully equipped with Wireless Internet, iPod/MP3/CD docking station, cable TV, DVD, as well as bedroom, bathroom and kitchen linens. There is a 3-piece bath with a washer and dryer, on the main level just off the kitchen. On the second floor you will find the bedrooms and a four piece bathroom. The home comfortably sleeps 6. The Harbour House is located in the quaint fishing village of Murray Harbour. It is only a 5 minute walk to where you will find casual dining, the library, craft shops, general store, marina and the Confederation walking/biking trail. A five minute drive takes you to beautiful sandy Beach Point or the Cape Bear Lighthouse, where the SOS from the Titanic was received. Enjoy Eagles View, a picturesque 9 hole local golf course. World class golf courses Crowbush, Dundarave, and Brudenell are only 30 minutes away. Charlottetown, with its great shopping and theatre is only 45 minutes away. Bring your bikes and kayaks to explore the most beautiful place on the Island. Newly renovated with hardwood and terracotta floors. Baby gate provided for stairs. Coffee, tea, sweetner, sugar, flour and spices ie. salt/pepper/oregano/garlic powder/basil/parsley etc. Tin foil/plastic wrap/sandwich bags all provided. All linens and cutlery included. 5 minute car drive to Eagle's View 9 hole golf course. Perfect location to stay and explore! This house is absolutely perfect. The owner allowed us to bring our corgi and he loved his first big road trip. The house has everything needed and the owner obviously put thought into making it comfortable and well appointed. No complaints, no issues and we loved staying in Murray Habour. There are several beaches nearby, several places to eat out at and there's a small store in the town. The Confederation Trail is across the road so bring your bikes. We had everything needed to enjoy our vacation. Thank you for your kind comments. We always enjoy positive feedback. So glad you enjoyed your stay. Thank you for your wonderful review, it is always nice to hear you were comfortable and enjoyed your stay at the Harbour House. We loved our stay at the Harbour House, a lovely renovated older house. Diana and Stephen have thought about everything for the house, including a great selection of board and outdoor games, which the kids loved playing in the evenings. The Harbour House is conveniently located in Murray's Harbour walking distance from two nice restaurants and Butlers grocery/hardware store. Only a 10 minute drive from Rossignol Vineyards, a very nice winery. We enjoyed exploring eastern PEI, Harbour House was a perfect starting spot. So many nice beaches within 15 minute drive of Harbour House, we really enjoyed Panmure Island and Beach Point, only 4.1km from Harbour House. Diana and Stephen made us feel so welcome and are fantastic hosts. Thank you Andy and Chantal for your wonderful review, we are so pleased you all enjoyed your stay. Glad we found this place! Beautiful cottage! Very well appointed with everything you need for a wonderful stay in PEI. We especially enjoyed the beautiful deck with view of the water. Perfect place to drink your morning coffee or relax in the evenings. Location is amazing too. A short drive to the warmest beaches we enjoyed in PEI. Roughly one hour day trip to major attractions ( green gables, Charlettown). Highly recommend this place! Thank you for your kind comments! We truly strive to ensure that each guests' stay at the Harbour House is a comfortable one, and one that will make you want to visit again! Beautiful spot and beautiful cottage. This is the best cottage we’ve been at on PEI. It’s very bright and modern and has that beach feeling that we were looking for. It sits on a beautiful lot as well with lots of privacy and a gorgeous view of the sunset. It has everything you need. Huge barbecue and lovely wrap around deck with seating. There are a couple of beaches that are only a minute away, which is perfect. We loved this place and plan on returning. Thank you for your thoughtful comments. We are so glad you enjoyed the Harbour House and its amenities. We'd look forward to seeing you again! We really enjoyed our stay at the Harbour House. We have rented many houses over the past 10 years and this house is by far the best. The kitchen is very well equipped and the living room and bedrooms are very clean and comfortable. It is located in a quiet village not far from the ocean. Diana the owner is very helpful and friendly. We highly recommend it. Thank you for your kind comments! We are very pleased everything met your needs or exceeded them. We hope you return soon! Outdoor activities such as croquet, bocci, washer game, various board and card games and movies.